Our day started with breakfast in the hotel. Then the group gathered and Martin Klimenta and I gave some brief welcoming remarks. Martin is Czech and works for MIR, our Seattle-based Russian tour company. He traveled with us the whole way and is such a pro at his job--I couldn't have asked for a better travel partner. 1) Russia has always had a complex about being backwards and behind other world powers. 2) Stalin was determined to catch-up and especially to have influence in Europe. 3) The railway was built to put Russia in a key position as the link between Europe and Asia. 4) It never lived up to that potential. We were then off for our first full day of touring. First stop: The Tretyakov Gallery, considered one of Russia's finest art museums. We spent time in the 18th, 19th, and 20th century galleries, and got a great Russian history lesson from our excellent guide, Irina. My favorite painting was Philipp Malyavin - The Whirlwind. It is huge, and at first looks like a sort of surreal landscape. But when you look closer, you realize that it is actually dancers. After lunch we headed for the Kremlin. Silly me always figured that there was just one "Kremlin." In fact, "Kremlin" means fortress, and it is a common term--many cities have "Kremlin's"of their own. 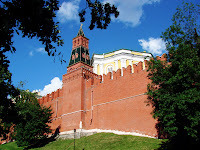 Moscow's Kremlin is surrounded by a red brick wall with 20 watchtowers. It is so big that when you are inside, you're not really aware of the walls. It seems like a well-maintained park--lots of trees and grass--lovely, really. There are a lot of government buildings, including the President's house, and all of them are painted bright yellow. There is also a large public performance hall, the Armory Museum, and three cathedrals and two churches in an area called Cathedral Square. Many of the Tsars were crowned and buried in one of the cathedrals. Within the Kremlin are also the world's largest bell and cannon. Neither ever worked, though they seem to be points of pride! There were definitely guards standing around, however the areas we were in felt very open and the security did not seem tight. That said, one of our group stepped over a low security barrier to get a photograph and within a second whistles were blowing and guards were shooing him back! We were able to go inside one of the Cathedrals and learned a lot about the Russian/Eastern Orthodox church (where I believe Jack was baptised). We also hurried through the Armory Museum and saw a lot of possessions of the Russian royalty-- carriages, ball gowns, lots of armor and several Faberge eggs. Dinner that night was in a strange teriyaki restaurant--we had to walk through a bunch of tattooed teenagers and a TGI Fridays to get there! We were all so tired, it hardly mattered.